What is a Green School? : A Green School is a resource-efficient building one that uses little water, optimizes energy efficiency, minimizes waste-generation, catches and recycles water and provides healthier space for its occupants as compared to a conventional building. The field of environment education is dogged by a very fundamental contradiction. While everyone, everywhere, asserts the importance of ‘learning to live sustainably’, environment remains a peripheral issue in the formal schooling system. It continues to be viewed more as an extracurricular activity and less as a subject with a priority position in the national curriculum. This is true not only in India but worldwide as well.Fortunately, it has not deterred many talented, creative and farsighted educators from experimenting and evolving extremely innovative teaching methods, materials and practices. The novelty of CSE’s Green Schools Programme lies in the fact that it moves beyond theories and textbooks and concentrates solely on ‘doing’. It is an environmental education programme directed to subtly sensitizing students to the environment through hands-on and thoughtprovoking activities. It is also an environment management system that audits, through students, the consumption of natural resources within school campuses and helps schools become good environmental managers by deploying pragmatic solutions to reduce wastage of precious resources. GSP helps, with proper governance, all schools become Green Schools over a period of time – i.e. schools that use little water, optimize energy efficiency, minimize waste-generation, catch and recycle water and provide a healthier space for their students as compared to a conventional building. Rc.446, Dt.01-8-2017: GREEN SCHOOL PROGRAMME(GSP) -Design cell- Organisation of Green School Programme in collaboration with centre for science and environment. The attention of all the District Educational Officers in the state are invited to the references cited that the Government has forwarded the letter reference 2nd cited and informed that the Centre for Science and Environment is organizing a program to Audit the Schools under Green School Program, which requires Registration of Green Schools under the Green School Program Audit Launch in July, 2017 and requested to immediate necessary action to register the schools under Green School Audit Program in Andhra Pradesh and send the compliance report to Government. Further, the Principal Secretary to Govt. E.F.S & T. Department A.P, Secretariat, Velagapudi, Amavaravati has stated in the reference 2nd cited that Centre for Science and Environment, New Delhi submitted proposals to initiate the Green School Program Audit in at least 1500 Schools in Andhra Pradesh. In Andhra Pradesh, already 3250 Eco Clubs have been constituted in schools and working various aspects of Environment Education with the support of Government of Andhra Pradesh & Government of India.The Centre for Science and Environment is organizing a program to Audit the Schools under Green School program, which requires Registration of Green Schools under the Green School Program Audit Launch in July'201 7. There is no fee charge for registration / Participation in Green School Audit program. The School Education Department is to register / participate in the program. The Centre for Science and Environment will be organizing the Green School Program Award Ceremony as an Annual Even in New Delhi sometime during December 2017 or January 2018. 1. The Centre for Science and Environment (CSE), New Delhi submitted proposals to initiate the Green School Program Audit in at least 1500 Schools in Andhra Pradesh. 2. 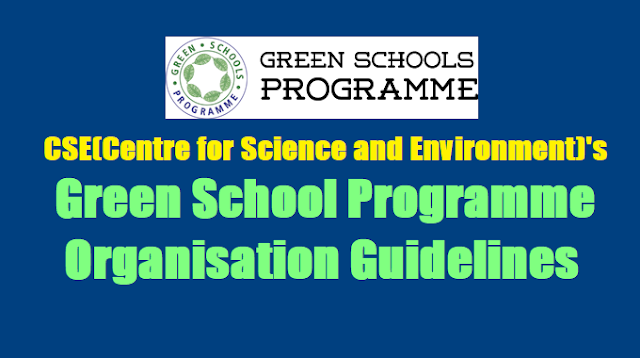 The Centre for Science and Environment is organizing a program to Audit the Schools under Green School program, which requires Registration of Green Schools under the Green School Program Audit Launch in July'2017. 3. There is no fee charge for registration / Participation in Green School Audit program. The School Education Department is to register / participate in the program. 4. The Centre for Science and Environment (CSE) will be organizing the Green School Program Award Ceremony as an Annual Event in New Delhi sometime during December 2017 or January 2018. 5. This program most of the Participating Schools and Children's will be aware about Environment Protection in general and Cleanliness,Rain water harvesting, personal hygiene, keeping the surroundings clean and Green, which will ultimately help people and the State. 6. To initiate the Green Schools Programme (GSP) audit in at least 1500 eco club schools and these schools to participate and submit their Audit reports. 7. The Centre for Science and Environment (CSE) also proposes to institute the GSP Andhra Pradesh State rolling Trophy for schools in each of the 13 districts to keep-up the motivation and recognize efforts of competitive schools. 8. The project is called GSP Gold and the model project is an exclusive engagement with five selected schools in Delhi / NCR to bring about change and sustain the green initiatives launched. 9. We propose to initiate GSP Gold in selected five schools of Andhra Pradesh, with the support of Andhra Pradesh Department of Environment,Forests, Science &Technology. 10. Registration for GSP Audit is open throughout the year. Schools need to register before the Audit launch - July 2017 in the web site i.e http: //www.greenschoolsprogramme.org/registration/. 11.Schools can purchase the audit manual directly from Centre for Science and Environment (CSE) (Rs.125), the cost can be debited to the Eco-club activity fund. The audit is available in the online http: //www.greenschoolsprogramme.org/audit/,for which the manual need not be purchased. 12. Students from class 6th to 8th / middle school can participate in the audit process. For each task a group / team of five-six students and one teacher should be formed, for the six themes (Air, Energy, Food, Land, Water and Waste). 13. All management of schools in the state of Andhra Pradesh may be participate / register 116 schools in each district.Should be covered all mandal in the district. 14. The audit should be conducted any time between July,2017 to October,2017.A school should not take more than two months to complete the audit report. Though the deadline to submit the GSP audit is October 31 (every year). 15. The Green Schools Report of short-listed schools will be scrutinized,verified and the best schools will be identified for the awards. 16. The results will be made public at the GSP website by January / February 2018. 17. All the Schools that had submitted audit reports will be given colour coded coded certificates according to their scores. 18. The last date for online registration is October 2017.